Decision-making in American government and other institutions in the 21st century is likely to become more authoritarian and will drift away from the democratic ideals of the Enlightenment. That�s the main conclusion John C. Merrill, a professor emeritus of journalism, reaches in Call to Order, which is sure to be one of his most provocative books. "The postmodern inclination toward relativism and subjectivism, when faced with the real dangers of human survival, will begin to fade away and ... acute dangers require strong leaders, and disorder � exemplified in the 20th century politics � will demand ever-stricter government controls and social order. Hobbes, with his clarion call from Plato, will raise his voice again against the champions of people�s sovereignty. Human responsibilities will increasingly replace human rights as power-systems step in to bring order to nations and to larger governmental blocs. In the name of the poor and downtrodden, the exploited environment, the impulse to egalitarianism, and the need for a common health care and education, the state controllers will join forces to centralize power in their hands. As citizens become more individually impotent ... social order will be assured." 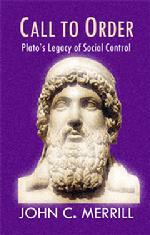 In Call to Order, Merrill summarizes Plato�s ideas about social control, which emphasize a benevolent but authoritarian system, and then briefly traces its legacy, covering all major thinkers up to the present. Merrill is particularly concerned about the rise of neo-Marist theories, postmodernism, and the communitarianism and public journalism movements. "They have not directly condemned freedom, but in very subtle ways have proposed limiting the power of the media managers and putting it in the hands of the citizens or in government agencies. The assumption here is that some extra-press authority would be more responsible managers than are the current directors, publishers, and editors." He writes that "communitarianism today is trying to reestablish community and values, to put the society above egoistic individualism, and to stress social obligation rather than an obsession with personal freedom. The collectivity in a sense becomes the authority � a kind of democratic authoritarianism. Does this mean that the �community� has some sort of authority? It seems so, but its nature is amorphous. At any rate, individualism must be lost or subsumed in the community." Merrill isn�t completely pessimistic. He says newspapers like The New York Times, France�s Le Monde, and England�s The Independent will continue to improve and provide credible information. However, the long-term prospects for libertarian ideas of freedom and individuality are not promising. Call to Order is highly readable and sure to spark considerable debate among scholars from numerous disciplines as well as from students in upper-level undergraduate and graduate courses in media theory, First Amendment and media ethics. John C. Merrill is professor emeritus of journalism and mass communication at the University of Missouri-Columbia. He has been teaching, writing, and lecturing at American and foreign universities since 1950. He is author or coauthor of more than 30 books, including The Elite Press, The Imperative of Freedom, Existential Journalism, Twilight of Press Freedom, The Dialectic in Journalism, Legacy of Wisdom, Media Mission and Morality, and The Princely Press: Machiavelli on American Journalism.